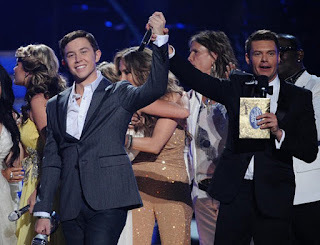 Current American Idol Scotty McCreery dominated the charts with the release of his debut album, Clear As Day, this week. He received #1 spots on the following charts: Billboard 200, Top Country Albums, Top Digital Albums, Top Internet Albums, and Top Current Albums. Billboard charts are either based on sales, airplay, or a combination of sales & airplay. The American Idols have now accumulated 314 #1s to date, counting all national, domestic charts compiled by the Billboard Information Group. Just one week after his album release, and Scotty is already tied with David Cook, Josh Gracin, and Jordin Sparks for #1s! Congrats, Scotty! Scotty was in Detroit today for the 99.5 WYCD Backyard BBQ. You can see more photos HERE No details on what he performed.... hopefully some videos are released soon! Scotty will be making an appearance during tomorrow's episode of Top 20 Countdown on CMT. According to CMT.com, Evan Farmer interviewed Scotty to find out details on Clear as Day. It airs at 11 am. This morning, nominations for the 2nd annual American Country Awards were announced. The awards show, hosted by Trace Adkins and Kristin Chenoweth, will air live from the MGM Grand Garden Arena in Vegas on December 5th (8-10pm ET). *PLEASE NOTE** THERE HAS BEEN SOME PROBLEMS WITH THE VOTING PAGE AT ACA *** WHEN PEOPLE ARE VOTING FOR SCOTTY IT IS CONFIRMED FOR ANOTHER PERSON IN THAT CATEGORY **PEOPLE HAVE NOTIFIED ACA VIA EMAIL. The other video of TTWG live on the Opry that I posted here was removed by the user, I found another one, so Im putting it here. If I find That Old King James, I will add that too. 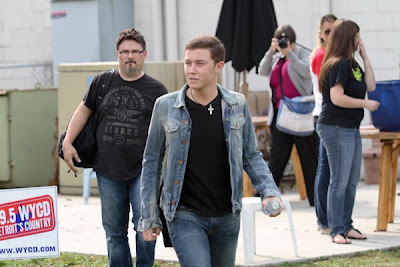 Scotty McCreery next single possible before the holidays? I just wanted to highlight part of what Rolling Stones magazine had to say about Scotty's singles being released to radio. I know several of you have wondered why we aren't hearing more songs off the album, and when the next song might be released. I agree it will probably be right before the holiday's. This will keep his sales going throughout the year and over the holidays. WINNER OF THE WEEK: American Idol. 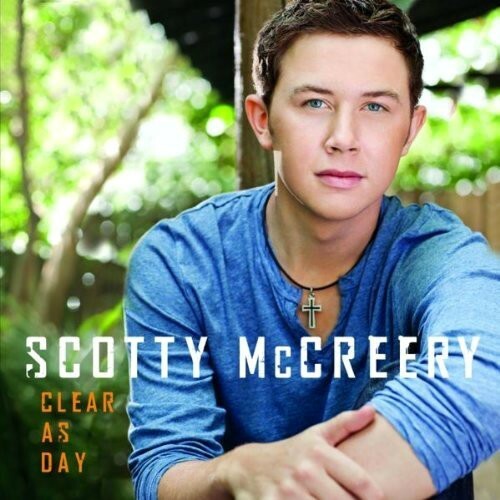 Scotty McCreery – who knew? Other than the Idol judges and millions of voters, of course. Last season's winner lands at Number One on Billboard's Top 200, selling 197,000 copies of Clear As Day, becoming the first Idol winner to take that spot since Ruben Studdard in December 2003. 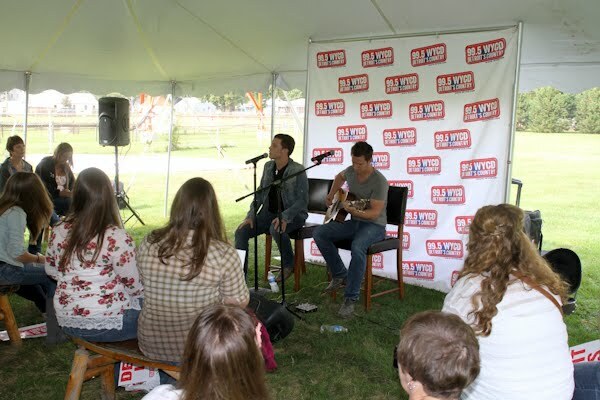 McCreery is also following standard country-music-business practices. He isn't flooding the charts with singles, Lil Wayne-style; he's methodically putting them out three months at a time ("I Love You This Big" immediately after the Idol finale last May, "The Trouble with Girls" in August). So there is absolutely no new action from McCreery on the singles charts – no iTunes, no Ultimate Chart. As we preach just about every week, he'll need another big one to prove his staying power. We suspect, given Idol stars' history, this will happen in time for holiday shopping. Scotty on the front of Yahoo. Thanks for the screencap! In a time where album sales have declined drastically over the years, it's an amazing accomplishment for Scotty McCreery. While other American Idol winners, or runner ups may have had larger debut sales, album sales have drastically declined over the years, and this is an amazing debut total for today's economy. And McCreery is the first country artist to debut at #1 with an initial studio album. With first-week sales totaling 196,739, he is the first new country artist this year to debut at No. 1 on the Billboard 200. He has the second-highest debut week for a new artist in all genres in 2011, behind rapper J.Cole. Scotty McCreery has only been 18 for three days, but so far so good. The day before his birthday, he celebrated with 15,000 fans in Raleigh, N.C. (one town over from his hometown of Garner) and received a gold plaque for his first single, “I Love You This Big,” selling more than 500,000 copies. Then on Tuesday, he played country’s most sacred spot, Nashville’s Grand Old Opry, alongside Trace Atkins and LeAnn Rimes. Later that night, the “American Idol” got confirmation that his debut album, “Clear As Day,” was a lock to enter the Billboard 200 at No. 1, making him the youngest male artist of any genre to achieve that feat with his first studio set. So how did he celebrate? By continuing on with interviews and promoting “Clear As Day.” Hitfix talked to the unfailingly polite McCreery Wednesday morning (he even called early) about coming in at No. 1, how he spends his rare time off, what he won’t sing about, and the prom. I grew up in Raleigh, so he and I couldn’t help but engage in a little chat about top N.C. past time —golf —as well as what it means to be a Carolina gal and girl. You got the best 18th birthday present ever. How did you find out that “Clear As Day” went to No. 1? You topped Adele on the chart. That must feel good. The thing that’s really cool about Adele is she’s been going strong for weeks on end. It’s amazing to see what she’s doing but it’s just wild to see ”Clear As Day” take off like it’s doing. We’re excited about it. With “Clear as Day,” you found your voice very quickly. The song selection is material that seems to speak to you. How many songs did you plow through to come up with the final choices? Oh, we went through a bunch, and the label, they’d gone through a lot before they even got to me. We had a big meeting in Nashville with the songwriters and the publishers and told them what we wanted to have on the album and what kind of topics we were looking for, so after that, the songs were really coming down the pipeline, a bunch at a time. It was fun getting the songs and I think we picked the right ones. What did you tell the publishers that you weren’t looking for? What was on your "No" List? We all know the stuff that’s 1) not me and 2) that I can’t sing about like going to the bars at night or all that romantic stuff. I just wanted to sing about real-life things and that’s what we wanted to put on the album. 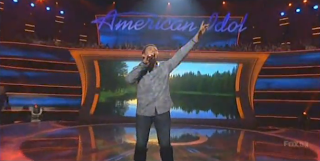 Scotty McCreery triumphantly soars to No. 1 on Billboard Hot 200 with his debut album "Clear as Day" by selling 197,000 copies in its first week. The country singer, who was crowned the winner on "American Idol" last May, becomes the first "Idol" champion to bow at the top spot of the chart with his first release since Kelly Clarkson did so with her 2003's "Thankful". Additionally, Scotty is the first country act to debut at the penthouse of the U.S. album chart with his first studio album. The "Love You This Big" hitmaker, who turned 18 last Sunday, October 9, is also the youngest male artist to go straight to the No. 1 place at the first try. Prior to him, it was Omarion who scored the unprecedented feat at the age of 20 with his 2005's "O". "My hopes were just to go out there and have fun," Scotty said in a statement regarding his newly-released effort. The teen singer, who has agreed to go on a tour with Brad Paisley next year, added, "Everybody hopes for the number one, but you never really expect it. To see it up there is pretty incredible." Beside joining Kelly as "Idol" winner to top the chart with the first album, Scotty also follows the footsteps of his other predecessor Ruben Studdard. The 2003 winner of the singing competition entered the weekly rundown at the first position with his album "Soulful". While Kelly bowed with 297,000 copies, Ruben scored 417,000 units. In the term of debut sales figure, Scotty pulls in the biggest number since David Cook's self-titled album landed at No. 3 with 279,000. He outdoes the opening numbers garnered by Kris Allen and Lee DeWyze. The former's eponymous effort opened at No. 11 with 80,000 copies and the latter's "Live It Up" started at No. 19 with only 38,000 units sold. Overall, Scotty scores the seventh-biggest debut sales week in "Idol" history. The first place belongs to Ruben who is followed by Carrie Underwood and Taylor Hicks at No. 2 and 3 respectively. Kelly secures the fourth position, and David and Fantasia Barrino trail behind her at the fifth and sixth in a respective order. On this week's Hot 200 chart, the second biggest new entry after Scotty is Feist. Her album lands at No. 7 with 38,000 copies sold. Rodney Atkins bows at No. 8 with "Take a Back Road" (35,000), and Jack's Mannequin enters at No. 9 with "People and Things" (31,000). The rest of the chart is dominated by holdovers. Former champ J. Cole is pushed down to No. 5, and Blink-182 who were runner-up last week move down a couple steps as well by sitting at No. 10. Unlike the two, the likes of Adele, Tony Bennett, Lady Antebellum and Lil Wayne climb up the chart with their respective albums.